VOL. I NO. 33 REG. NO. 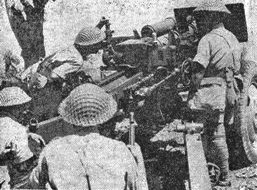 L5015 DELHI, THURSDAY APRIL 29, 1943. WELL, WE CAN DREAM, CAN'T WE? 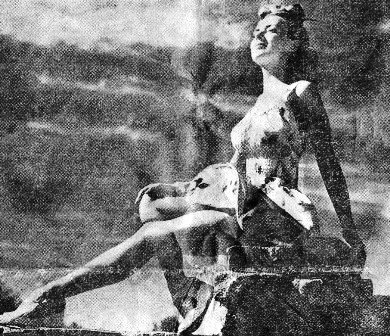 There's nothing a curvaceous movie star like Ann Shirley would rather do than absorb the rays of the California sun in a revealing costume. It's to be taken as mere coincidence, of course, that a camera man "happens" to be lurking around the place. Must you be so cynical? The spectacular American air raid on Tokyo a year ago was made from the aircraft carrier Hornet, since sunk after a valiant career. Planes were lost on the raid, but none through enemy action. Despite the loss in planes, the cost in human life was fantastically low. Pilots who carried out the mission consider it worth the price in view of material and morale damage caused the Japanese. These are the salient facts of the great Tokyo adventure as told Associated Press by eyewitnesses who bailed out over China, after making a successful circuit in twin-engined B-25 bombers from the deck of the aircraft carrier to Tokyo and on to China. One of the 18 bombers which made the mission came down intact in Siberia and was interned with its five-man crew. Maj. Gen. Jimmy Doolittle, who led the flight, brought down his plane intact in China, but he landed so close to Japanese lines in occupied China that he was forced to destroy the plane to keep it from falling into the hands of the Japs. What threw the plans out of gear was a Jap tanker, which sighted them some 800 miles from Japan and managed to get off a warning message before it was sunk. Fearing the Japs might try to intercept, the bombers were forced to take off immediately 200 to 300 miles farther away than planned. This precipitated a series of complications, the most serious being bad timing and a shortage of gasoline required to reach a safe landing field in China. The fact that the planes took off despite the fact they knew they were heading into certain trouble even if they escaped harm from the Japs, who they no longer could hope to surprise, is hailed as an example of courage of 80 American Air Force volunteers, who went on the mission. Listen to a typical story told by one of the pilots. First he tells about the preparation. Volunteers were taught to lift heavily-loaded B-25s from a field in 700 feet instead of the normal 3,000 and to cut fuel consumption well below normal. After less than a month's training in Florida, they flew to California and sailed on the Hornet. There were 16 planes and 20 crews aboard. "In violation of every rule of military procedure and every concept of human decency, the Japanese executed several of your brave comrades who took part in the FIRST raid on Tokyo. "These men died heroes. We must not rest - we must redouble our efforts until the inhuman war lords who committed this crime are utterly destroyed. "Remember those comrades when you get a Zero in your sights - have their sacrifice before you when you line your bombsight on a Japanese base." Four planes were damaged from a variety of mishaps, but the crews were brought along anyway. The planes were tied, wing to wing, on the deck of the Hornet. Cruisers, destroyers and tankers accompanied the aircraft carrier. After three days spent refueling in mid-ocean, the little convoy set off again. 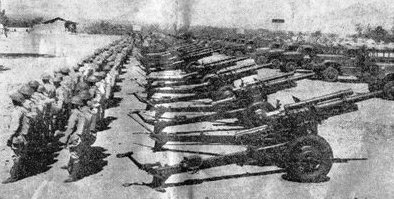 They ran full throttle from night to early morning - when the Jap tanker was sighted. "One of the cruisers dashed out and reported back it had sunk the tanker in 23 seconds. But the tanker had managed to dispatch a radio message, as it developed later. We were then 810 miles from Japan. We had hoped to be in as close as 500 to 600 miles. That would have carried us on into the afternoon, making it a night raid as planned. But we were compelled to take off immediately, converting it into a day raid and multiplying our hazards. "As the crews climbed into the cockpits, the members of the four crews who had no planes, ran around the deck waving fists full of $100 bills trying to buy places on the planes. There were no sales. Doolittle took off first at 8 a.m. The others followed, all 16 getting off okay. Three hours out from the carrier we sighted a Japanese scout bomber. It changed course, obviously studying us. With our speed, we ran away from it. But it was ample indication the tanker had got a message through, for otherwise a scout wouldn't have been so far out at sea. "We came in low over Tokyo Harbor, but climbed to about 2,500 feet over the middle of the city. We reached Tokyo about an hour and a half after the first plane went over. Our target was a chemical works. It seemed we were a century on that run. We dropped our bombs and incendiaries. Then we dived for speed and pulled away from the target. A small piece of our rudder was shot away. Nine Zero fighters attacked us, but we shook them off with our speed. 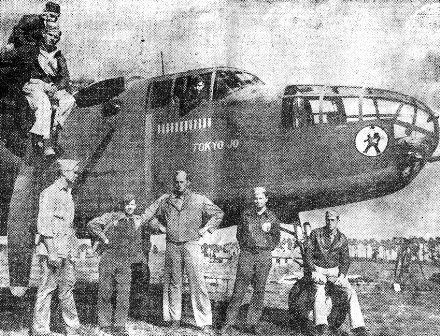 THEY CHASED HIROHITO TO HIS CELLAR These eight officers and men of a China-based 14th Air Force bomber squadron flew with Maj. Gen. Jimmy Doolittle a little over a year ago on the Tokyo raid. Gathered around "Tokyo Jo" they pledge to get Hirohito "next time." hit him. He didn't follow. We rounded the southern tip of the Japanese islands and turned west into China. The plane did beautifully. We detoured a few ships. At sundown we spotted our course and had one hour of gasoline to go. Twenty-five miles off the coast of China, we ran into bad rains, so climbed slowly to save our gas. "We leveled of at 8,000 feet and sat watching the gas needle go down and down. It was now dark and raining violently. We made ready to bail out. The navigator destroyed his charts and maps. We fastened chutes on. We had the plane full of Baby Ruth candy bars and 70 cartons of cigarettes. We stuffed our pockets full. The rear gunner went first. 'Thanks for the ride,' he said. 'I am leaving.' My chute filled with water. When the chute filled, it flipped off my web belt and canteen. Candy bars were thrown out in all directions. My gun, strapped to my shoulder, stayed on. "I bailed out at 10:10 p.m. I must have been knocked out when I landed. In the dark I landed in a relaxed state, not knowing when I was going to hit the ground, so I was unhurt. When I came to, I was on a hill soaking wet. It was cold as hell - too cold to sleep. In the morning I went into a village. People ran into their houses." The pilot then tells how he passed through several more villages, until he entered a big one at 4 p.m. where he located a magistrate who spoke some English. The magistrate was "100 percent good" to the pilot and helped him establish contact with other pilots in a neighboring village. Ten days after the bailout, all the crews, except the five members interned in Siberia and a small number killed, missing or captured, reached a rendezvous point - an air base in east China. The original plan had been to alight at the base, where magnificent "bomb Tokyo" runways had been built by Army coolies, refuel and fly on to Chungking. But some planes did not have gas enough to get that far because they had to leave the carrier sooner than expected. 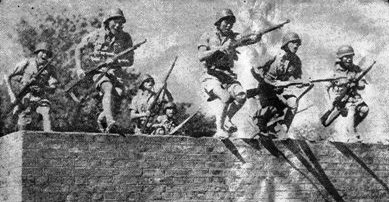 Driven to fury by the Tokyo raid, the Japanese bombed the east China base three times daily while the Americans were there, while Japanese troops pushed fiercely a campaign that ended with the capture of the airfield only a short time after the Americans escaped. WINGS OVER CHINA Sgt. 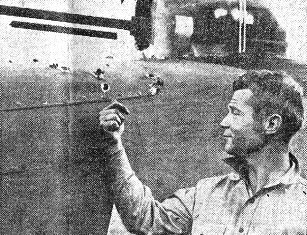 Jack Gould, of the 14th Air Force, points to the holes punched in his bomber plane by a Jap Zero. A moment later, the gunner shot down the Nip with the gun shown over his head. By train and bus, the Americans went from east China to Chungking, undergoing almost daily bombing and strafing from the Japs, but coming through unscathed. They arrived in Chungking the first week of May, to be greeted by a hysterically happy populace, and proceeded to India a few days later. All had fabulously dramatic adventures to recount. One crew landed in the sea and had to swim two and a half hours before it reached land when its rubber boat capsized. Some came down in Chinese guerilla country and had a rough time of it until they were able to prove their identities. Some cut up their silk parachutes and used them as money to buy food. All, however, declared "The Chinese were simply swell to us after they learned our identities." Some of the participants in the raid have since been killed on other missions. Of the survivors, 18 are still serving in the C.B.I. Theater, while 32 returned to the United States. Eyewitnesses said they considered the mission a success "because it was a feat of aviation taking overloaded land bombers off the deck of an aircraft carrier, because the Japs withdrew their fleet from the Indian Ocean (to protect Tokyo from danger of further raids) and because we got our target." "We lost men," they said, "but that was expected. We gave them a jolt and it was worth the loss of planes." WASHINGTON - Capts. Ted W. Lawson and Harold S. Watson, veterans of the Tokyo raid, told reporters at the War Department that they had carried out orders to bomb only pre-selected military objectives so faithfully that they had even passed up an unprotected aircraft carrier and a line of pursuit ships parked at a Japanese airport. As Watson's plane passed over the carrier, a crew member began yelling "Drop an egg on her." But Watson said that he proceeded to the designated machine tool works and steel smelter south of Tokyo. Lawson crash-landed his plane on Chinese soil after the raid. Later he had a leg amputated. CONGRATS Here is the first picture of Gen. Henry H. (Hap) Arnold sporting four stars on his shoulders. A raid on Bangkok, Thailand, and successful sweeps against targets in the Rangoon area were highlights of the 10th Air Force activities during the past week. 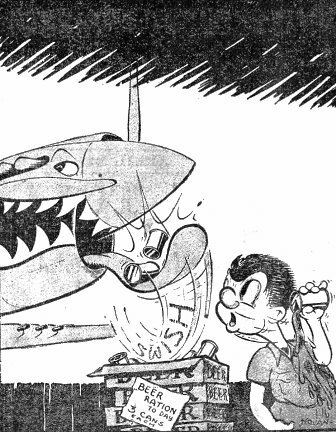 It was the third time that Bangkok had been visited by American bombers, but the small formation of B-24s could not estimate the damage inflicted because of poor weather for observation. Other activity on the same day included a B-25 attack on Rangoon, a B-25 mission against Maymyo and P-40 raids against enemy stores and troops at Hpunginzup and Kamaing. 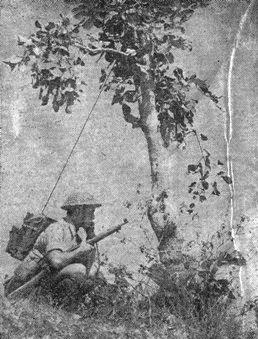 During the night of April 22-23, B-24s pounded enemy targets in the Rangoon area. A formation which bombed Thilawa oil refinery reported hits in the target area, and two formations which bombed the Mahlwagon railroad yards reported good results and added they set a fire that spread over three city blocks. The other formation reported hits on enemy buildings and warehouses, causing five large fires. B-25s hit buildings, warehouses and railroad tracks at Mandalay. There was no other communiqu� until Tuesday. It told principally of bullseye hits on April 26 upon the Thilawa oil refinery by B-24s. An aircraft previously reported missing was announced as safe. There are no other details. INDIA BOMB SQUADRON - "There'll be no promotion this side of the ocean, so cheer up, my lads, bless 'em all." Ask Lt. Arthur L. Gaudreault. A master sergeant and communications chief in a medium bombardment squadron at a USAAF base here in India, Gaudreault last week received a commission as second lieutenant, proving again that it can be and is done. Gaudreault can justifiably sport his gold bar with elan. An Army man of six years' experience, he has served in the Panama Canal Zone, in South America and Africa as well as in this Theater. Besides having flown as bombardier on a number of missions, Gaudreault has been bombsight maintenance and communications chief in other organizations of this Theater. He was trained in the states in radio at Chanute Field, Ill., in bombsight maintenance at Lowry Field, Colo., and in bombardiering at Langley Field, Va. - By Cpl. LEO COAN. 'WITH LOVE' "With love from J. J." 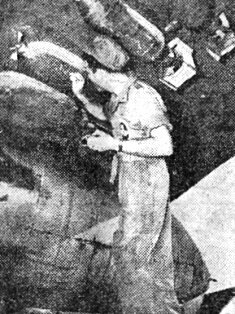 Maj. James A. Philpott paints on a bomb that the "Skull and Wings" medium bomb outfit soon dropped upon the Jap in Burma. SUBJECT: Press release on Capt. Hampshire. 1. FLASH - The squadron has another ACE. 2. "Baldy Hapshire has done it again," was the cry that rang through the luxurious shower rooms (hot and cold folding doors and hand-painted meditation booth) of the Squadron Beach Club directly after a recent Jap fight. Maj. Baumler, now residing in that foreign country, the United States, was the first ACE of the squadron and, in fact, of China. The last Zero makes a even half dozen for the captain, repudiating the vote of the crew chiefs this year as the one most likely NOT to succeed. Commented one pilot, "I think he does it with mirrors, because we all know that he couldn't hit a cow with a banjo in the middle of a stampede." While another pilot had it straight from the Chinese net that the Japs intentionally fly into his stream of bullets in accordance with their "hari kiri" belief. This distrustful person hails from Grants Pass, Ore., where he fought his way through high school and a couple of years of college before he entered the Air Corps to assist in obliterating his trail, which was so closely followed by the Sheriff. When questioned as to how he did it, the captain, who is the soul of modesty, shuffled his feet, gazed into the sky and shyly remarked, "I guess I am just damn good, that's all." - GREG CARPENTER, 1st Lt., Air Corps., Public Relations Officer. Sturdy, aggressive Capt. Sun, of the Engineers, is typical of the Chinese officers at the base. Under Sun's direction, soldiers maneuver into position a floating center span for a bridge. 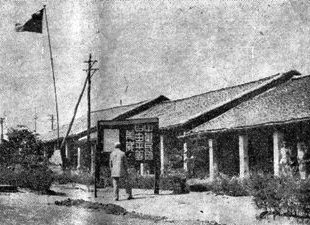 Headquarters for the Chinese Expeditionary Force is utilitarian, rather than pretentious. Note the Chinese flag and bulletin board. Physical fitness is a primary factor in infantry training. The obstacle course hardens ground troops for the campaign which they will launch one day against the Jap. Chinese soldiers stand at attention before an American weapon with which they plan to harass the Jap - the 105mm howitzer, packed by sturdy horses and mules. The rugged 105mm howitzer packs a heavyweight punch, the Chinese have discovered during exercises. Familiarity with weapons is stressed. A favorite of the troops is the 30 caliber heavy machine gun. 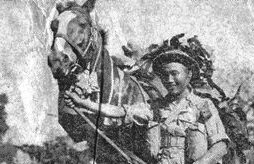 An artilleryman's best friend is his horse, especially when operations are to take place in Burma. Using the walkie-talkie, scouts radio information to their command post during a realistic field exercise. Parades like this exemplify the spirit of the camp. 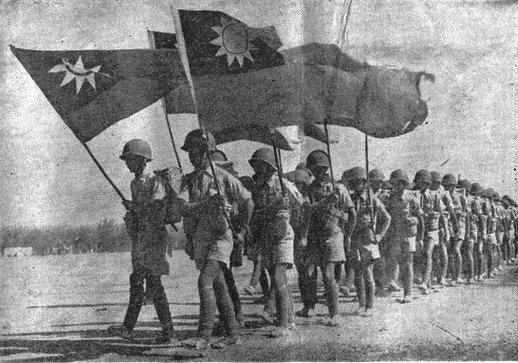 The color guard carries Chinese flags proudly, as troops march by in columns. The Chinese are determined to plant these same standards in Burma's soil. 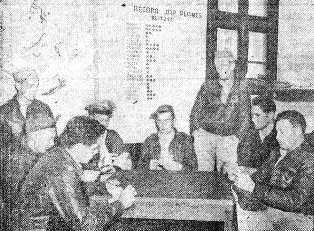 BOYS WHO WALKED BACK Fighter pilots of the 14th Air Force who have bailed out over enemy territory and spent from one week to two months getting back to their bases in China have formed the "Walkers Club." Sitting around their club room batting the breeze, playing cards and waiting for their next mission are, left to right, Maj. Grant Mahony, Lt. C. C. Vaughn, Lt. L. R. Durrell, Capt. J. O. Wellborn, Lt. Morton Sher, Lt. Col. Bruce K. Holloway, Lt. M. D. Marks and Lt. C. C. Moody. that they were waiting for a "boat" ??? That must be a new name for it, but they're still stuck with the story. Hmmmmm. Promotions and ratings flew thick and fast during the past month at our Q.M. base in Assam. Two of our officers - C.O. 1st Lt. Wise and 1st Lt. Stomes - were both the happy recipients of one each, captaincy. Not to be outdone by higher headquarters, Capt. Wise also made with the ratings. Those who were lucky to be in the way when Wise passed them out were as follows: Pvts. Jackson, McClure, Bruce, Westfall, Wheatley, Gargano, Sinclair and Cooper. All were on the receiving end of what the British call "lance corporal," but what we coyly refer to, in better circles, as Pfc. Even one of our boys in "Way Way" China, Pfc. Louis F. Hall, received a brand new bouncing tech fifth and, when last reported, both Hall and the T/5 were doing fine. To our midst, we now welcome 2nd Lt. Frederick M. Gregory, who came into the Army a private some 18 months ago, arrived in India, and proceeded to "Per Diem Hill." (Gregory claims that "Per Diem Hill" has been reduced to a "Mound" lately and that the boys are having trouble with their three (3) bucks a day - Sure tough, ain't it?) Gregory went from private to tech sergeant in the Air Corps and was commissioned in the Quartermaster. WUXTRA - THEY CAN FLY THE 'HUMP' This strip of pictures recently released by the War Department and given worldwide distribution by the OWI, illustrates in a small way the hazards of flying the "Hump" from India to China. Capt. Arthur S. Welling, one of General Joseph W. Stilwell's personal pilots, supervises the loading of supplies and baggage into his plane preparatory to hopping off for China. A glimpse from the plane windows shows what is probably the world's most rugged terrain - the Himalaya Mountains. Altitudes required are so high that it is necessary for pilots and passengers to wear oxygen masks. ASSAM - The story is being told here how one American pilot helped another from his hometown to safety after bailing out. The pilots are Lt. George M. Colarich and Capt. John Svenningsen, of St. Paul, Minn. Each was flying a P-40 in a formation which was returning to its base from a patrol over Burma. Colarich's engine suddenly failed and he was forced to jump. Under ordinary circumstances, Svenningsen, who was leader of the formation, would simply have wirelessed to the home base asking them to send help. However, the terrain made it too difficult for the landing of even a puddle jumper. This being the case, Svenningsen carefully noted the spot where Colarich went down and then flew on to the base for help. Emergency supplies were loaded on a transport and were rushed to the spot, with Svenningsen coming along as a guide. The supplies were dropped by parachute. Two days later, Svenningsen flew low over an American outpost looking for Colarich. Colarich had arrived there safely on his own two legs - his only means of travel - for he signaled Svenningsen's plane with a pistol which had been dropped with supplies. pirated and the gang gyrated to the music of the Yank Swing Session and Hit Parade and the dulcet, velvet voices of Bing Crosby, Dina Shore and Ginny Simms. Several Russian girls, two American misses, the usual flock of Hong Kong beauties and three U.S. sailors were the outside guests of the evening. Brig. Gen. William Bergin and Capt. E. T. Cowen were the only officers invited to the "Anniversary Hop," which ended abruptly at 1 a.m. when the city power failed and every man was faced with the problem of looking out for himself. Our HQ softball team took a terrific 14-11 licking from Chungking U., and the vodka-soaked lads found that chasing Chinese home runs was a good cure for the Yang-Tze jitters. 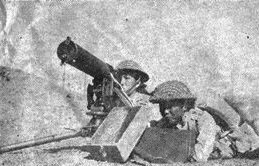 The team's major mistake was listening to the tall talk of a newcomer from the Delhi Signal Corps - Cpl. H. Hearn by name. He accorded himself the honor of being the best softball pitcher in all CBI-land. His smoke ball had dazzled Delhi, his no-hit games were too numerous to mention, etc., etc. the Mighty Hearn that he was better qualified as a third base coach. Say "All others come first." And what is more you're a most unusual "doc" my son. Lie scarred upon his face. A man who walks alone. "A rupee, sahib, one please!" With lightning in his eye. Oh, was he here? Most surely! All cool within my palm. Old 170 was a pilot's pride. But she always stalled at a hundred and ten. And for one long month she would fly all right. Read the Tech Order . . . but too literally. And the crash resounded to the Pearly Gate. The pilot spun in to eternal fire. Because the Tech Order was a G-- D-- liar. And there is a damn good chance that you will probably live. INDIA AIR TASK FORCE HQ. - At long last the N.C.O. Club at IATF Headquarters thrust open its doors to the thirsty throng. Glasses clinked, the phonograph beat against the buzz of conversation. Bartenders S/Sgts. Alex Worgaftik and Ed Succop chatted amiably with the customers and the happy occasion was celebrated with repressed hilarity. Not yet complete was the club room, situated in one end of the new mess hall building, but though fancy furnishings and interior decorations were lacking, the essential elements were present, and were sold over the bar in quantity. Life of the party was T/4 John Murphy, of the Corps of Signals, who, aided by ample glasses of Vermouth, rendered his version of the "Strip Polka," the entire assemblage joining in on the chorus to make the rafters ring with "Take it off, take it off," etc. John was ultimately poured into a bed at a late hour by Sgt "Os" Bluemel and Cpl. Ed Walthery, but next morning felt quite chipper, stating: "Yes, I had quite a time - they tell me." Cpl. Vic Odgetts, Royal Air Force, is attached to Headquarters for duty, a sort of "Jerk in the USAAF" to even things with Tyrone Power. Vic is an ardent but outnumbered partisan of the Eighth Army, and during his waking hours has to contend with more ribbing than Adam in the Garden of Eden. Befuddled by baseball, he got his chance to shine when someone produced a soccer ball one night recently, promising to show the lads "how proper English football is played." In short order he had a gang of shouting troopers dashing around in the dark, walloping the ball and one another with abandon. 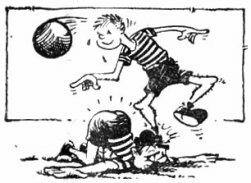 Vic, however, became casualty No.1, some ruffian stretching him on the turf, after which both teams trampled over his face in pursuit of the ball. Football, says Vic, is a rough game. The Army takes care of its own: S/Sgt. Ray A. Lent, wounded in air action a while back, lay in the hospital fretting for mail from home as only a guy in that position can. Then came a radiogram, just "All my love, Maxine" but the message, passed through the office of the CG, Army Air Forces, Washington, with instructions for prompt relaying along the line, had flashed through in as many hours as it would have taken days via normal channels. Lent is one boy who thinks the Army is O.K. SOMEWHERE IN INDIA - 'Twas a better than average day along about 0945. The clock in the hospital lab was ticking away the seconds. Suddenly, the atmosphere was rent asunder by a muffled but definite explosion. Just the type of detonation that puts one to thinking of slit trenches and air raids. No more was to be heard concerning the incident until chow time, and then the stark naked, unadulterated truth was out. The latrine orderly, pour le four, namely Normal C. Engle, had begun his task of rendering the latrine presentable and as nearly sterile as possible. He had been spurred on by the thought that the C.O. had just returned and might possibly make the inspection personally. He shouldered his implements and set about his duties. All went fine. The latrine was made orderly, looked presentable. But it lacked sterility, so the next step would be to make life miserable for the amebic and bacillary parasites of dysentery and any other form of simple animal life which chanced to inhabit the habitat. So our hero obtained petrol, poured it into the pit. Not being familiar with the volatile characteristics of petrol, he whistled a gay tune and, after due time, ignited a piece of paper and inserted it into the pit. As you can imagine, the results were loud and instantaneous. In short, a helluva racket ensued. So up went our combination smoking room, rumor center, reading nook and meditation booth!